Infections caused by extended spectrum beta-lactamases (ESBL)-producing bacteria have been emerging worldwide and the majority of ESBL-producing E. coli strains are isolated from patients with urinary tracts infections. The purpose of this study was to compare the host-response mechanisms in human polymorphonucleated leukocytes (PMN) and renal epithelial cells when stimulated by ESBL- or non-ESBL-producing uropathogenic E. coli (UPEC) isolates. The host-pathogen interaction of these ESBL-producing strains in the urinary tract is not well studied. The ability of ESBL strains to evoke ROS-production from PMN cells was significantly higher than that of the non-ESBL strains. The growth of ESBL strains was slightly suppressed in the presence of PMN compared to non-ESBL strains after 30 min and 2 h, but the opposite was observed after 5 and 6 h. The number of migrating PMN was significantly higher in response to ESBL strains compared to non-ESBL strains. Stimulation of A498 cells with ESBL strains elicited lower production of IL-6 and IL-8 compared to non-ESBL strains. Significant differences in host-response mechanisms were identified when host cells were stimulated by ESBL- or non-ESBL producing strains. The obtained results on the early interactions of ESBL-producing strains with the host immune system may provide valuable information for management of these infections. Antibiotic resistance is an emerging health issue that poses a serious threat to public health worldwide. Extended spectrum beta-lactamases (ESBL) are enzymes able to inactivate beta-lactam antibiotics such as penicillins, cephalosporins and monobactams by hydrolysis. ESBL are defined as enzymes that can be transferred, mainly on plasmids, hydrolyse third generation cephalosporins and are inhibited by clavulanic acid, tazobactam or sulbactam . There are three major groups of ESBL enzymes; TEM, SHV and CTX-M and these can be further divided into subgroups. ESBL enzymes are predominantly found in the bacterial species Klebsiella pneumoniae and Escherichia coli but may also be found in other species of Enterobacteriaceae. These bacteria are common causes of urinary tract infections (UTI) and may also cause sepsis, respiratory tract- and intra-abdominal infections . ESBL-producing organisms have previously been associated with nosocomial infections but community-acquired infections mainly due to CTX-M-producing E. coli are emerging . The majority of all ESBL-producing bacteria are isolated from urine samples and most of these bacteria are E. coli. Treatment of infections caused by ESBL-producing bacteria is often complicated due to concomitant resistance to other classes of antibiotics such as fluoroquinolones, aminoglycides, trimethoprim/sulfamethoxazole and tetracyclins . The prevalence of ESBL-producing uropathogenic bacteria has increased in the last decades. In southern Europe, 21% of the community  and 18% of the nosocomial  urinary tract infections (UTI) are caused by ESBL-producing E. coli. The host-responses to infection by uropathogenic E. coli (UPEC) are characterized by neutrophil migration into the tissue and production of pro-inflammatory cytokines . The early response of effector cells such as uroepithelial cells and neutrophils to UPEC may influence bacterial clearance and thereby the outcome of the infection. It is not yet established whether ESBL-producing isolates have different virulence properties or pathogenic potentials than non-ESBL producers. Studies performed on expression of virulence factors and phylogenetic groups among ESBL-producing E. coli strains have not been conclusive [2, 8]. Furthermore, data on the effect of ESBL-producing strains on activation of host effector cells are limited. Some studies have showed that ESBL-producing K. pneumoniae are able to impair the respiratory burst of polymorphonuclear leukocytes (PMN)  and have a higher ability to invade ileocecal- and bladder epithelium  compared to non-ESBL-producing strains. A higher proportion of ESBL-producing K. pneumoniae strains were reported to be serum-resistant and therefore able to withstand the bactericidal effect of serum . ESBL-producing E. coli have been reported to stimulate higher production of pro-inflammatory cytokines from human monocytes compared to susceptible E. coli. It is well known that UPEC can stimulate pro-inflammatory pathways, but recent studies indicate that some UPEC strains have the ability to suppress activation of host-response mechanisms. UPEC were demonstrated to suppress production of pro-inflammatory cytokines from bladder epithelial cells [13, 14] and attenuated neutrophil migration  compared to non-pathogenic E .coli strains. It is not known if ESBL-producing UPEC strains have an enhanced ability to modulate the host-response and evade the immune system or if they are successful in establishing infections only because of their antibiotic resistance. Thus, it remains to be established how ESBL-producing UPEC interact with the host immune system in the urinary tract. The purpose of this study was to compare activation of host-response mechanisms in human PMN and renal epithelial cells when infected by ESBL- or non-ESBL-producing UPEC strains. Eight ESBL-producing and 11 non-ESBL-producing (susceptible) E. coli, isolated from standard patient care individuals with suspected pyelonephritis, were obtained from the Department of Microbiology at Örebro University hospital, Sweden. The identity of the patients was anonymized and after that further analyses of the strains were performed. Antimicrobial susceptibility testing was performed as recommended by the Swedish Reference Group for Antibiotics (http://www.srga.org) and the isolates were genetically characterized for CTX-M, TEM and SHV type by real time PCR and nucleotide sequencing and stored as previously described . MG1655, a well-characterized and non-pathogenic E. coli K-12 strain and CFT073, a UPEC strain isolated from a patient with pyelonephritis, were used as control strains. The bacteria were cultured on tryptic soy agar (TSA) overnight at 37°C prior to any experiment. Colonies were suspended in phosphate buffered saline (PBS) to the appropriate concentrations. A498 cells (HTB-44, ATCC) are human renal epithelial cells derived from a kidney carcinoma. A498 cells were cultured in Dulbecco's modified eagle medium (DMEM, Sigma-Aldrich, St. Louis, MO, USA) containing 10% fetal bovine serum (FBS), 1 mM non-essential amino acids, 2 mM L-glutamine, 50 U/ml penicillin and 50 μl/ml streptomycin (all from Invitrogen Ltd, Paisley, UK) at 5% CO2 and 37°C. Prior to the experiment the cell-culturing medium was replaced with DMEM containing 2% FBS, 1 mM non-essential amino acids and 2 mM L-glutamine (penicillin and streptomycin were excluded). DNA was isolated from 2–3 colonies grown on TSA plates. The colonies were suspended in 100 μl sterile water and the suspensions were boiled for 15 min, cooled to 4°C and subsequently centrifuged for 30 s at 12 000 × g. The amplification was performed by using 10 μl SsoFast EvaGreen® Supermix (Bio-Rad laboratories, CA, USA), 2 μl of primer (250 nM), 2 μl genomic DNA (in total 50 ng) and 6 μl water. All primers were ordered from Eurofins MWG Synthesis GmbH (Ebersberg, Munich, Germany). The amplification was performed in CFX96 Real-time thermocycler (Biorad Laboratories, Hercules, CA, USA) as previously described . The A498 cell line was stimulated with the different bacterial isolates and the viability of the cells was assessed after 6 h. Multiplicity of infection (MOI) of 10 was used (5 · 105 cells were stimulated with 5 · 106 CFU of bacteria). The viability of the cells was assessed by the trypan blue (0.4%) exclusion test in a cell counter (TC10™ automated cell counter, Bio-Rad) and by the cytotoxicity detection kit plus-LDH (Roche Diagnostics, Indianapolis, IN, USA) according to manufacturer's protocol. Human polymorphonucleated leukocytes (PMN) were isolated from whole blood using polymorphprep (Axis-Shield PoC AS, Oslo, Norway). Blood was collected according to the swedish national board of health and welfares guidelines and the ethical guidelines of the declaration of Helsinki. The healthy volunteers gave a written informed consent for research use and the samples were anonymized immediately after collection. The donors were not subjected to extra harm or risk as the blood was collected at the same occasion as a blood donation. According to paragraph 4 of the swedish law (2003:460) on ethical conduct in human research, this study did not require ethical approval. Briefly, polymorphprep was layered with an equal volume of heparinized blood and centrifuged at 1350 rpm for 40 min at room temperature. The PMN fraction was collected and an equal volume of 0.45% NaCl and 20 ml PBS was added. Any remaining erythrocytes were removed by hypotonic lysis with sterile milliQ water. Cold PBS containing 3.4% NaCl and Krebs-Ringer glucose (KRG) were added to restore osmotic pressure. The PMN were centrifuged, the supernatant discarded and the pellet resuspended in 1 ml PBS, KRG + Ca2+ or DMEM + 4-(2-hydroxyethyl)-1-piperazineethanesulfonic acid (HEPES). The viability of the PMN was > 90% as determined by the trypan blue exclusion test. Total reactive oxygen species (ROS)-production of PMN was measured with a luminol-horseradish peroxidase (HRP) assay. Luminol is activated by H2O2 and the evoked luminescence is proportional to ROS-production. PMN in KRG + Ca2+ were incubated with luminol (0.1 mg/ml, Sigma) and HRP (4 U/ml, Roche) for 15 min at 5% CO2 and 37°C. PMN and bacteria (MOI 10) were combined in a 96-well plate. Phorbol-12-myristat-13-acetat (PMA) was used as positive control and KRG + Ca2+ as negative control. The plate was centrifuged at 400 × g at 4°C for 3 min and the luminescence was measured in a microplate reader (Fluostar Optima, BMG Labtech, Aylesbury, UK) every third min for 4 h. All samples were run in duplicate. PMN and bacteria (MOI 10) were combined in a 96-well plate in cell culturing medium (DMEM + HEPES). As a control, bacteria were grown in an equal volume of cell culturing medium. The plate was incubated at 5% CO2 and 37°C and the absorbance was measured in a microplate reader (Multiska Ascent, Thermo labsystems, Helsingfors, Finland) at 620 nm every 30 min for 6 h. The absorbance of PMN cells only was measured and subtracted from the absorbance of the co-incubated samples (bacteria + PMN). The relative growth inhibition (delta OD620) was calculated as absorbance of bacteria-(absorbance of bacteria + PMN). The viability of the PMN was > 80% as determined by trypan blue exclusion test 6 h after bacterial stimulation. A498 cells were seeded onto a inverted 3 μm pore size transwell insert (Falcon, BD Biosciences Pharmingen, San Diego, USA) for 3 h (at 5% CO2 and 37°C) to facilitate cell settling. After 3 h the inserts were placed in 6-well plates with fresh medium and the cells were cultured on the inserts for 2 weeks at 5% CO2 and 37°C. Medium was changed every second day. The cells were pre-stimulated with the bacteria (MOI 10) for 4 h by adding the different strains to the bottom wells. The PMN were prepared as described above and 106 PMN were added to the top well after the pre-stimulation. PMN cells were collected from the bottom well after 1 and 3 h and counted in a cell counter (TC10™ automated cell counter, Bio-Rad). An enzyme-linked immunosorbent assay (ELISA) was performed to measure the cytokine production of A498 cells stimulated with different bacterial strains for 3 and 6 h. The cytokines IL-6 and IL-8 were measured using human IL-8 and IL-6 kits (ELISA MAX™ Deluxe Sets, BioLegend, San Diego, CA, USA). The variables were normally distributed and differences between groups were evaluated with the unpaired Student’s t-test or one-way ANOVA followed by Bonferroni test. Differences were considered statistically significant when p < 0.05. Data were presented as mean ± standard error of the mean (SEM), n = number of independent experiments. The renal epithelial (A498) cells were stimulated with the different bacterial isolates for 6 h and the cell viability was assessed. Bacterial isolates that decreased the cell viability (> 20%) were not suitable for the in vitro infection study design and were excluded. Two ESBL-producing (2/8; 25%) and five non-ESBL-producing (5/11; 45%) isolates were excluded based on this criteria. Six ESBL-producing and six non-ESBL producing isolates remained for investigation. The characteristics of the different isolates included in the study are summarized in Table 1. All ESBL-producing isolates belonged to either the CTX-M-14 or CTX-M-15 enzyme type. The phylogenetic analysis showed that 50% of the susceptible strains belonged to the B2, 33% to the B1 and 17% to the D group. The majority of the ESBL-producing strains belonged to the B2 group (83%) and the rest belonged to the D group (17%) (Table 1). CTX Cefotaxime, CAZ Ceftazidime, CIP Ciprofloxacin, MEC, Mecillinam, TZP Pipeacillin/Tazobactam, TMP Timetoprim, CTB Ceftibuten, AmC Amoxicillin + Clavulanic acid, CXM Cefuroxim, SXT Sulfamethoxazole/Trimetoprim. Production of ROS by PMN is a key characteristic of the early host response to bacterial infections. The ESBL-producing E. coli strains evoked higher ROS-production compared to susceptible E. coli strains (p < 0.001) when analyzing the sum ROS production for the whole 4 h incubation period. The ROS-production induced by ESBL- producing and susceptible strains followed the same pattern with a low peak after 30 min and a higher peak after 2 h (Figure 1A). The ROS-production of PMN was markedly higher in cells stimulated with the non-pathogenic strain MG1655 compared to those stimulated with the UPEC strain CFT073. MG1655 induced a massive ROS-production after 30 min, approximately 5.5 times higher than the positive control PMA (Figure 1B). ROS production induced by ESBL- and non-ESBL-producing E. coli . Total ROS production in PMN stimulated by ESBL-producing strains, susceptible E. coli strains, a positive control (PMA) and a negative control (KRG) (A). The ROS production evoked by MG1655, CFT073, a positive control (PMA, 5 μM) and a negative control (KRG) (B). Data are presented as mean ± SEM luminescence (RLU) (n = 4-5 independent experiments). We next examined whether the observed differences between ESBL- and susceptible strains in evoked ROS production had any effects on the bacterial growth. The bacterial growth response was inhibited in the presence of PMN when compared to bacteria grown in the absence of PMN as shown in Figure 2A. In the presence of PMN, the CFT073 strain showed recovered growth after approximately 100 min while the growth of MG1655 was suppressed for approximately 270 min (Figure 2A). The growth of ESBL-producing E. coli was slightly suppressed in the presence of PMN compared to antibiotic susceptible E. coli after 30 min and 120 min (p < 0.05) (Figure 2B). However, after 300 and 360 min the growth of susceptible E. coli was slightly more suppressed compared to ESBL-producing E. coli (p < 0.05). The growth of MG1655 appeared to be more affected by PMN than the other strains but the difference in growth inhibition between MG1655 and CFT073 did not reach statistical significance (Figure 2B). PMN induced growth inhibition of ESBL- and non-ESBL-producing E. coli . 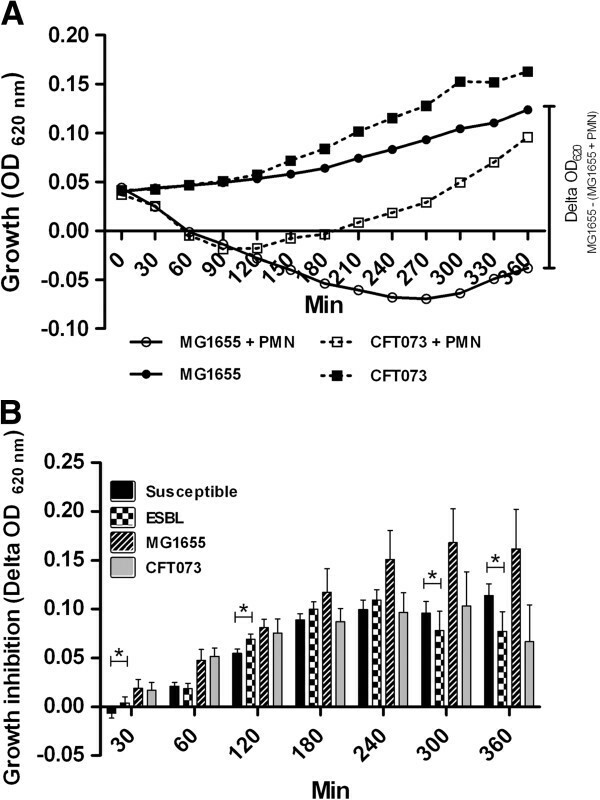 Growth of MG1655 and CFT073 incubated with PMN (MOI 10) or without PMN (A). Relative growth inhibition of MG1655, CFT073 and the mean relative growth inhibition of susceptible and ESBL-producing E. coli. The relative growth inhibition (delta OD620) is calculated as (absorbance of bacteria-(absorbance of bacteria + PMN)) (B). Data are presented as mean ± SEM (n = 3 independent experiments). Asterisks denote statistical significance (*p < 0.05). A transepithelial migration assay was performed in order to examine PMN migration evoked by the different E. coli strains. The transwell cell monolayer showed low levels of PMN migration in the absence of bacteria (data not shown). All strains evoked PMN migration after 1 h but there were differences in their ability to attract the PMN (Figure 3A). 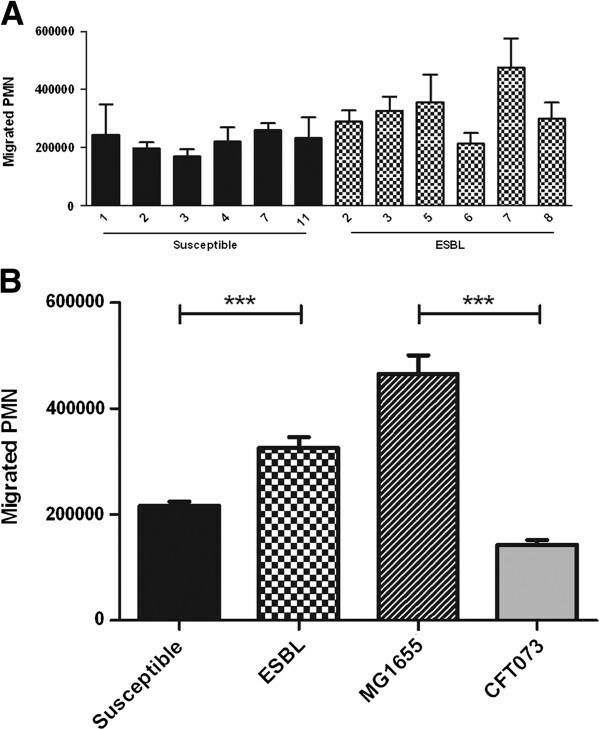 The ESBL-induced PMN migration was significantly higher 1.6 ± 0.13 fold (p < 0.001) than the migration induced by susceptible strains (Figure 3B). The MG1655 strain induced a significant higher 3.3 ± 0.44 fold (p < 0.001) migration than the CFT073 strain. MG1655 was also shown to attract the largest number of PMN compared to the other strains (Figure 3B). There were no differences observed between ESBL-producing and susceptible strains in their ability to attract PMN after 3 h (data not shown). PMN migration across a renal epithelial cell line layer in response to ESBL- and non-ESBL-producing E. coli. A498 cells stimulated by the individual bacterial strains (A), and the mean PMN migration across A498 cell layer stimulated with ESBL- and non-ESBL-producing strains, CFT073 and MG1655 (MOI 10) (B). Data are presented as mean ± SEM (n = 3 independent experiments). Asterisks denote statistical significance (***p < 0.001). The activation of pro-inflammatory cytokines from urinary tract epithelial cells was evaluated. Both the ESBL-producing and the susceptible strains induced a significant higher IL-6 and IL-8 production from A498 cells compared to unstimulated cells after 6 h. No significant difference was observed between the ESBL- producing and susceptible strains in their ability to induce cytokine production after 3 h (data not shown). The IL-6 and IL-8 production of A498 cells revealed differences between the individual strains (Figures 4A and 5A) and notably, strains that induced high IL-6 production did also induce high IL-8 production. 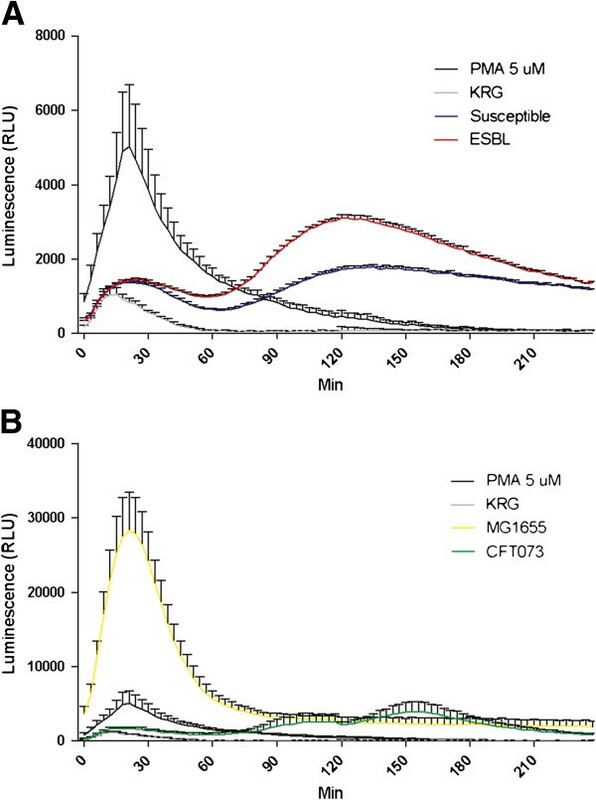 The cytokine production of A498 cells incubated with ESBL-producing strains when grouped together was significantly lower 28 ± 1.9% (IL-6) and 52 ± 3.5% (IL-8) (p < 0.05) compared to cells stimulated with susceptible strains (Figures 4B and 5B). The non-pathogenic MG1655 strain induced a significantly higher (p < 0.01) IL-6 and IL-8 production than the pathogenic CFT073 strain (Figures 4B and 5B). 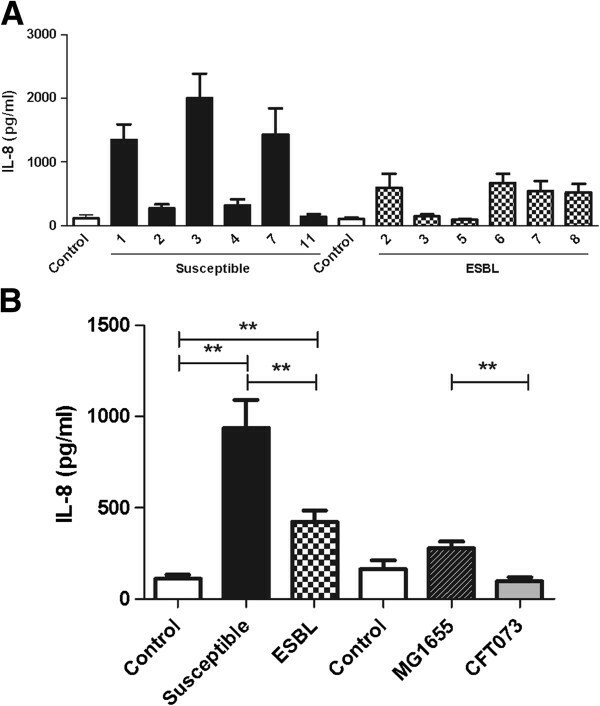 Induced IL-6 secretion of A498 cells in response to ESBL- and non-ESBL-producing E. coli . IL-6 production from A498 cells induced by the individual bacterial strains (A), and the mean IL-6 production of A498 cells stimulated with ESBL- and non-ESBL-producing strains, CFT073 and MG1655 (MOI 10) (B). Data are presented as mean ± SEM (n = 6 independent experiments). Asterisks denote statistical significance (*p < 0.05, **p < 0.01, ***p < 0.001). Induced IL-8 secretion of A498 cells in response to ESBL- and non-ESBL-producing E. coli . IL-8 production from A498 cells induced by the individual bacterial strains (A). The mean IL-8 production from A498 cells stimulated with susceptible and ESBL-producing E. coli, CFT073 and MG1655 (MOI 10) (B). Data are presented as mean ± SEM (n = 6 independent experiments). Asterisks denote statistical significance (**p < 0.01). In the present study we used an in vitro infection model to compare the host response evoked by ESBL-producing strains with non-ESBL-producing strains isolated from patients with pyelonephritis. Two ESBL- producing and five non-ESBL-producing-strains were excluded due to their cytotoxic potential. Thus, the most cytotoxic strains were not included in the study. However, the results suggest that susceptible isolates are more cytotoxic than ESBL isolates at least in vitro. Virulence factors such as toxins are known to decrease host cell viability and their expression may partly explain the observed differences in cytotoxicity. Hemolysin, cytotoxic necrotizing factor 1 (CNF1) and secreted autotransporter toxin (sat) have all been shown to be less prevalent in ESBL-producing E. coli strains than susceptible isolates [8, 18–20]. The ability of ESBL-producing E. coli to stimulate oxidative burst and evoke ROS-production from PMN cells was greater than that of the antibiotic susceptible strains. In contrast to our findings, a recent report showed that ESBL-producing K. pneumoniae induced lower levels of ROS-production from PMN compared to non-ESBL-producing strains . This indicates that there could be species differences. It has been suggested that one virulence phenotype of UPEC may have the ability to suppress ROS-production from PMN which ultimately could have an advantage in colonizing the urinary tract . Thus, our ROS-production experiments suggest that ESBL-producing strains may be less virulent than the susceptible strains. In support of a negative correlation between ROS activation and virulence, the non-pathogenic strain MG1655 was observed to induce the highest levels of ROS compared to the pathogenic E. coli strains. To compare how ESBL-producing and susceptible UPEC strains respond to the antimicrobial properties of PMN the growth response of the isolates when incubated with PMN was evaluated. In control experiments, the growth of the non-pathogenic MG1655 strain was markedly affected by co-incubation with PMN suggesting that antimicrobial species such as ROS are released in our assay. The fact that MG1655 induced the highest ROS-production of all the examined strains may explain the sustained growth inhibition. Some time-dependent differences in the growth of ESBL-producing and susceptible strains when incubated with PMN were observed. After 30 min and 2 h a slight increase in growth inhibition was observed for the ESBL-producing strains. Interestingly, at these time points ESBL-producing strains induced higher ROS-production from PMN compared to the susceptible strains, which may explain the observed differences in growth inhibition. However, at 5 and 6 h the growth of susceptible strains was slightly reduced compared to ESBL-producing E. coli. Thus, it appears that the antimicrobial effect evoked by PMN on ESBL-producing and susceptible strains may vary over time. No differences in the ability of PMN to kill ESBL- and non-ESBL-producing K. penumoniae strains were reported in an earlier study . Differences in expression and activity of possible resistance mechanism to antimicrobial factors may also affect the growth outcome. It has been shown that non-pathogenic E. coli are more sensitive to ROS exposure, at least in the form of hydroxygen peroxide, than uropathogenic CFT073 . Moreover, UPEC strains have been suggested to secrete effectors that interfere with pro-inflammatory pathways which could decrease the phagocytic activity of PMN cells and partly explain the increased tolerance compared to non-pathogenic strains [15, 21, 22]. Taken together, the higher evoked ROS production and the trend in growth inhibition of ESBL-producing strains in the early stages of infection may impair or delay the establishment of infection by ESBL-producing strains. An established in vitro transepithelial migration assay with infected A498 cells [23, 24] was used to compare PMN migration evoked by ESBL-producing and susceptible E. coli, respectively. The results showed that ESBL-producing strains evoked higher PMN migration than the susceptible strains. The non-pathogenic MG1655 strain induced a higher PMN migration than all of the pathogenic strains which has been shown in a previous study . Bacterial suppression of neutrophil migration, mediated by the periplasmatic protein YbcL, has been proposed as an important trait used by uropathogens to modulate host-response pathways . Thus, the higher PMN migration evoked by ESBL-producing strains compared to susceptible strains might impair the propagation and colonization of ESBL strains in the urinary tract. Again, ESBL-producing UPEC strains appear to be less virulent than susceptible UPEC strains based on the suggested association between low ability to suppress neutrophil migration and low virulence . The pro-inflammatory cytokines IL-6 and IL-8 are produced by uroepithelial cells as part of the early immune response and are important for the clearance of the infection [25, 26]. 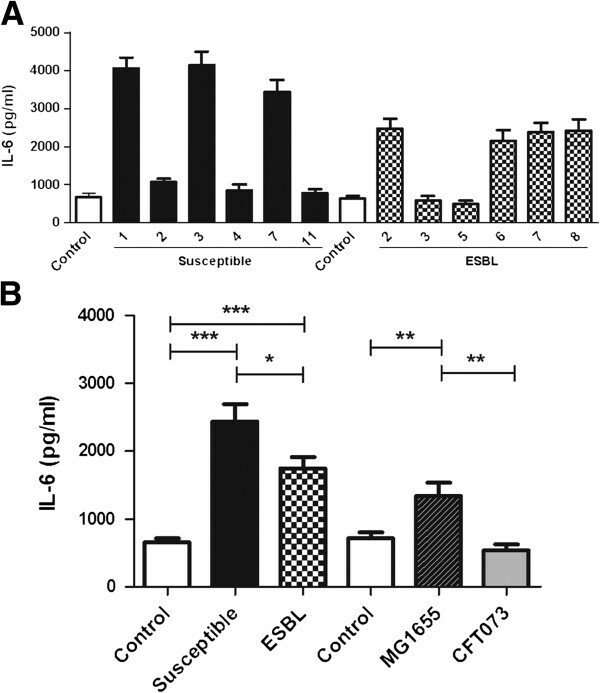 Production of IL-6 and IL-8 from renal epithelial cells stimulated with ESBL-producing strains was found to be lower than that of cells stimulated with susceptible strains. In contrast to our results, a recent study found that the IL-6 and IL-8 production of monocytes stimulated by ESBL-producing E. coli was higher compared to monocytes stimulated by susceptible E. coli. This suggests that ESBL-producing E. coli strains have the ability to evoke diverse cytokine patterns from different immunoactive cells. Recent studies have shown that UPEC strains induce lower levels of the pro-inflammatory cytokines IL-6 and IL-8 from bladder epithelial cells than non-pathogenic K-12 strains [13, 14] by a mechanisms involving suppressed activation of the pro-inflammatory NF-κB pathway . In our study, the UPEC strain CFT073 evoked minimal cytokine production in support of a suppressive phenotype compared to MG1655 as previously reported [13, 14]. The ESBL-producing and susceptible isolates showed variations in their ability to induce IL-6 and IL-8 production. Strains that failed to induce cytokines were found in both groups but notably, among the strains that were able to active cytokines, the cytokine levels were always higher in cells infected by susceptible strains. A limitation of the present study is that only few isolates were used. However, the included isolates are likely to be representative UPEC isolates as the majority of them belonged to the B2 or D phylogenetic group [8, 28]. In a previous study (Önnberg et al., manuscript submitted) the present ESBL-producing E. coli isolates were characterized by using rep-PCR (DiversiLab [DL], bioMerieux, Marcy l'Etoile, France). The isolates belonged to three different DL-types and the predominant was DL-type 1 (67%). All DL-type 1 isolates belonged to the ST131 clone. No correlation was found between the ability of the isolates to stimulate ROS or cytokine production with the CTX-M type, phylogenetic group or ST131 clone. Our results are in agreement with previous observations that CTX-M-producing isolates are dominated by the B2 phylogroup and the globally disseminated ST131 clone [29, 30]. Further studies are needed to characterize potential virulence factors, including type 1- and P-fimbriae and capsular types among the clinical isolates. The newly identified virulence factor TcpC is of special interest. Some UPEC strains have the ability to secrete effectors like TcpC that are able to suppress innate immune responses, including cytokine secretion from uroepithelial cells . Taken together, if the capacity to suppress cytokine release from uroepithelial cells can be regarded as a virulence characteristic, ESBL-producing UPEC strains appear to be more virulent than susceptible UPEC strains. This is in contrast to the findings from experiments using PMN where ESBL-producing strains appeared to have characteristics supporting low virulence. Increased knowledge and understanding of bacterial virulence properties may be essential when identifying novel therapeutic targets for multiresistant, ESBL-producing Enterobacteriaceae. One virulence property that has been recognized among UPEC strains is their ability to modulate the innate host defense to their favour [13–15]. The majority of the results in the present study strengthens the argument that ESBL-producing E. coli strains are less virulent than susceptible strains which has been reported in previous genetic studies [8, 28]. ESBL-producing E. coli have been reported to express fewer virulence factors than susceptible isolates and CTX-M-producers expressed fewer virulence factors than other types of ESBL-producing E. coli[8, 28]. In animal models, infection with ESBL-producing E. coli showed prolonged survival of the infected animals compared to animals infected with susceptible bacteria [8, 12]. The prolonged survival time was correlated to a lower expression of virulence factors . Knowledge of host-bacteria interactions of importance for establishing urinary tract infections by ESBL-producing strains may provide valuable information for improved management of these emerging infections. Targeting bacterial virulence factors is an alternative approach that offers opportunities to inhibit pathogenesis and its consequences without placing immediate life-or-death pressure on the target bacterium . Thus, by inhibiting specific mechanisms that promote infection, e.g., adherens, toxin production, invasion or subversion of host defences, new pharmaceutical tools effective against multiresistant pathogens may be developed. In the present study we conclude that differences in evoked host-response mechanisms exist in vitro between ESBL-producing and non-ESBL-producing UPEC strains. More research is required to explain the mechanisms behind these differences and also to find out whether differences exist between ESBL-producing and non-ESBL producing UPEC strains in in vivo models of UTI. The authors acknowledge support from the Swedish Council for Working Life and Social Research, Nyckelfonden at Örebro University Hospital and the Faculty of Medicine at Örebro University. The E. coli strains MG1655 and CFT073 were a kind gift from Dr Jana Jass at Örebro University. ID and KP design the study. ID, AK, AÖ and BS conducted the experiments. ID, AK, AÖ and KP analyzed the data. ID, AK, BS and KP drafted the article. All authors read and approved the final manuscript.